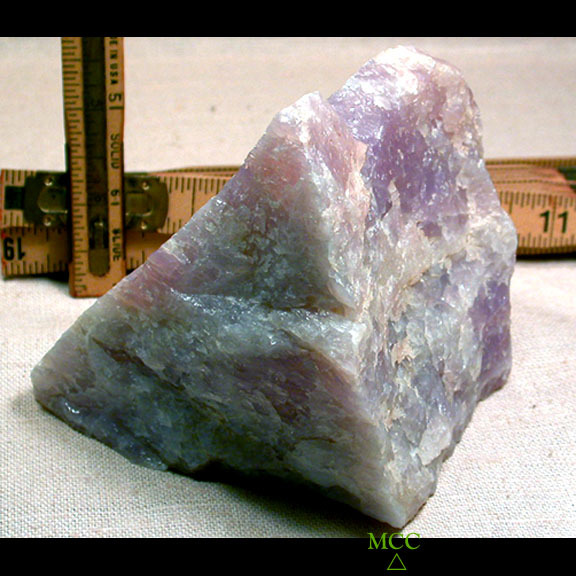 Very gemmy, very RARE, and the California mines have been closed for over 20 years now...this lavender rose quartz has fine deep coloring with milk quartz banding and some iron oxide. Lithium inclusion changes 'regular' rose quartz to the lilac-to-lavender hues found in this material; and is said to balance yin and yang - as it is neither pink nor blue. Lithium's the 'happy!'. 2 pounds, 5+ ounces, it self displays from any side of its' triangle. It's 3-3/4x 4x 4" and would also yield some amazing cut stones.